For years, people have known about New York City’s different neighborhoods, each with its own flavor and personality, but it may surprise visitors to San Diego that the beachside city also comprises more than 100 vibrant and distinct neighborhoods. Downtown alone is home to eight distinct neighborhoods, and (like New York) it includes an East Village. Once an empty warehouse district, the revitalization of San Diego’s East Village was ignited in 2004 with the opening of PETCO Park, the San Diego Padres’ baseball stadium. Today, visitors can enjoy fashionable restaurants and cafes, rooftop bars, adorable boutiques and a variety of hip hotels. 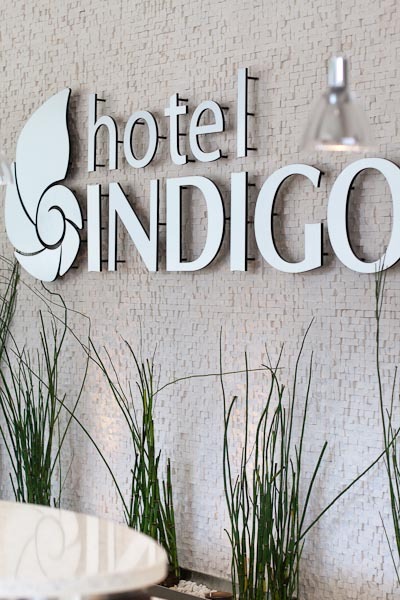 One of my favorite places to stay in the East Village is the Hotel Indigo, San Diego’s first LEED Certified hotel with a sleek, boutique vibe at prices that will make even the most budget-savvy traveler happy. In addition to their 24-hour “Phi”tness Studio, rooftop terrace with a reflection pool and fire pits, Hotel Indigo is known for their pet-friendly policy, making them a perfect fit for one of the country’s most pet-friendly cities. The ultimate time to check-in at the Hotel Indigo is when the Padres are playing at neighboring PETCO Park. If you’re a baseball fan, you don’t even need a ticket to enjoy the game. 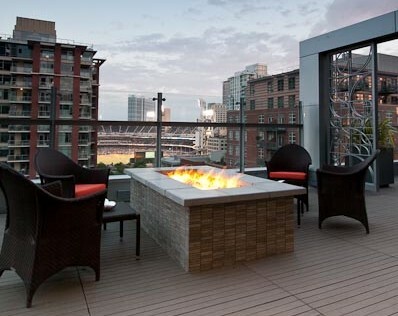 Pull up at chair at the hotel’s rooftop lounge, where you’ll have a first class view right into the ballpark. Cafe Chloe offers quaint, elegant French fare, including a killer croque madame. For foodies, the East Village offers up some spectacular eats. Start the day with a buttery croissant and cup of spiced hot chocolate at Cafe Chloe, a quaint bistro that brings the seductive charm and spectacular cuisine of a Parisian cafe to downtown. Neighborhood is a top dinner destination for locals, and Noble Experiment makes one of the best cocktails in town...if you can find it! For lunch or dinner, Neighborhood can’t be beat. As the name suggests, San Diego locals frequent this burger joint that is anything but typical. Their burgers, smothered with toppings like béarnaise sauce or tomato confit, are too good for ketchup, which is strictly forbidden here. After dinner, push through a hidden door at Neighborhood to sneak into San Diego’s secret speakeasy, Noble Experiment. This pint-sized bar has a big reputation for unique specialty cocktails crafted to the utmost standards by the city’s most beloved bartenders. Is the allure of the East Village calling to you? Leave a comment below to enter to win a one-night stay at the Hotel Indigo! A winner will be chosen at random from the commenters on Monday, June 4 at 10:00 am, so don’t miss your chance to take in this vibrant neighborhood first-hand. The Entry Period is Over. Shake off the last of the construction dust, it’s time to put out the welcome mat! The Hotel Indigo San Diego opens for business today in the East Village neighborhood downtown. Set just a block east of the Padres’ home at PETCO Park, the hotel is San Diego’s first LEED certified hotel – one of only 19 in the country. Among many ecologically-friendly elements, the brand-new 12-story building was designed for green roofs seeded with drought tolerant plants. Up on the 9th floor, the roof is home to an herb garden with basil, spearmint, rosemary and tarragon for use in the hotel’s Phi Bar and Bistro. Local artists, photographers and designers were brought in to help interpret San Diego’s inviting coastal culture with artwork throughout the hotel. The most striking example is the 40-foot tall glass sculpture on the building’s western facade. Inside, large-scale photo murals of water and native plants are installed in the guest rooms and public areas. The hotel features 210 guestrooms(including five suites) with oversized beds, plush bedding, hard wood-style flooring and spa-inspired showers with Aveda products. Each one boasts a 37-inch high-definition flat screen and guests are have access to free Wi-Fi in their rooms and throughout the entire hotel. The best place to log on? Up on the green roof at the Phi Terrace Bar where you can snuggle by the fire pits and enjoy panoramic views of downtown. Or, better yet, you’re on vacation! Stow the laptop, grab a beer and watch a game down in PETCO Park.